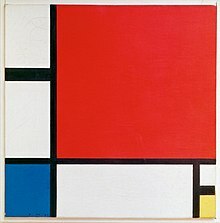 This article is about the general concept of art. For the group of creative disciplines, see The arts. For other uses, see Art (disambiguation). Works of art can tell stories or simply express an aesthetic truth or feeling. Panorama of a section of A Thousand Li of Mountains and Rivers, a 12th-century painting by Song dynasty artist Wang Ximeng. 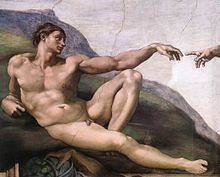 In the perspective of the history of art, artistic works have existed for almost as long as humankind: from early pre-historic art to contemporary art; however, some theorists feel that the typical concept of "artistic works" fits less well outside modern Western societies. One early sense of the definition of art is closely related to the older Latin meaning, which roughly translates to "skill" or "craft," as associated with words such as "artisan." English words derived from this meaning include artifact, artificial, artifice, medical arts, and military arts. However, there are many other colloquial uses of the word, all with some relation to its etymology. The more recent and specific sense of the word art as an abbreviation for creative art or fine art emerged in the early 17th century. Fine art refers to a skill used to express the artist's creativity, or to engage the audience's aesthetic sensibilities, or to draw the audience towards consideration of more refined or finer work of art. The nature of art has been described by philosopher Richard Wollheim as "one of the most elusive of the traditional problems of human culture". Art has been defined as a vehicle for the expression or communication of emotions and ideas, a means for exploring and appreciating formal elements for their own sake, and as mimesis or representation. 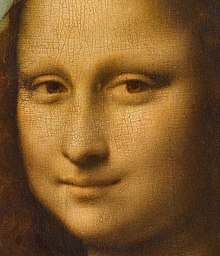 Art as mimesis has deep roots in the philosophy of Aristotle. Leo Tolstoy identified art as a use of indirect means to communicate from one person to another. Benedetto Croce and R. G. Collingwood advanced the idealist view that art expresses emotions, and that the work of art therefore essentially exists in the mind of the creator. The theory of art as form has its roots in the philosophy of Kant, and was developed in the early twentieth century by Roger Fry and Clive Bell. More recently, thinkers influenced by Martin Heidegger have interpreted art as the means by which a community develops for itself a medium for self-expression and interpretation. George Dickie has offered an institutional theory of art that defines a work of art as any artifact upon which a qualified person or persons acting on behalf of the social institution commonly referred to as "the art world" has conferred "the status of candidate for appreciation". Larry Shiner has described fine art as "not an essence or a fate but something we have made. Art as we have generally understood it is a European invention barely two hundred years old." The stylized signature of Sultan Mahmud II of the Ottoman Empire was written in Islamic calligraphy. It reads "Mahmud Khan son of Abdulhamid is forever victorious". 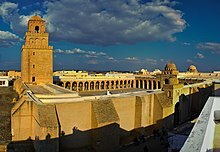 The Great Mosque of Kairouan in Tunisia, also called the Mosque of Uqba, is one of the finest, most significant and best preserved artistic and architectural examples of early great mosques. Dated in its present state from the 9th century, it is the ancestor and model of all the mosques in the western Islamic lands. Art for social inquiry, subversion and/or anarchy. While similar to art for political change, subversive or deconstructivist art may seek to question aspects of society without any specific political goal. In this case, the function of art may be simply to criticize some aspect of society. Art as a fitness indicator. 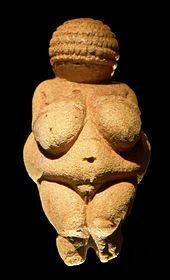 It has been argued that the ability of the human brain by far exceeds what was needed for survival in the ancestral environment. One evolutionary psychology explanation for this is that the human brain and associated traits (such as artistic ability and creativity) are the human equivalent of the peacock's tail. The purpose of the male peacock's extravagant tail has been argued to be to attract females (see also Fisherian runaway and handicap principle). 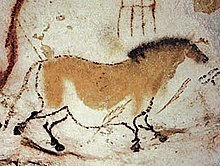 According to this theory superior execution of art was evolutionarily important because it attracted mates. 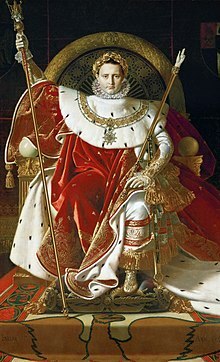 Versailles: Louis Le Vau opened up the interior court to create the expansive entrance cour d'honneur, later copied all over Europe. There have been attempts by artists to create art that can not be bought by the wealthy as a status object. One of the prime original motivators of much of the art of the late 1960s and 1970s was to create art that could not be bought and sold. 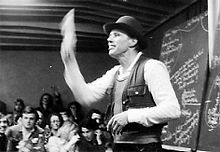 It is "necessary to present something more than mere objects" said the major post war German artist Joseph Beuys. This time period saw the rise of such things as performance art, video art, and conceptual art. The idea was that if the artwork was a performance that would leave nothing behind, or was simply an idea, it could not be bought and sold. "Democratic precepts revolving around the idea that a work of art is a commodity impelled the aesthetic innovation which germinated in the mid-1960s and was reaped throughout the 1970s. Artists broadly identified under the heading of Conceptual art ... substituting performance and publishing activities for engagement with both the material and materialistic concerns of painted or sculptural form ... [have] endeavored to undermine the art object qua object." 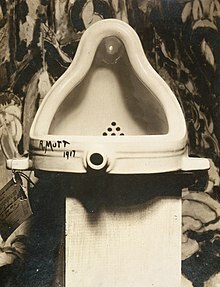 The original Fountain by Marcel Duchamp, 1917, photographed by Alfred Stieglitz at the 291 after the 1917 Society of Independent Artists exhibit. Stieglitz used a backdrop of The Warriors by Marsden Hartley to photograph the urinal. The exhibition entry tag can be clearly seen. ^ Gombrich, pp. 86–89, pp. 135–141, p. 143, p. 179, p. 185. ^ Gombrich, p. 155, p. 530. ^ Aristotle. "[Book 10:] The Poetics". Republic. www.authorama.com. Note: Although speaking mostly of poetry here, the Ancient Greeks often speak of the arts collectively. ^ "SciCafe – Art/Sci Collision: Raising Ocean Conservation Awareness". American Museum of Natural History. Archived from the original on 3 July 2013. Retrieved 21 February 2013.